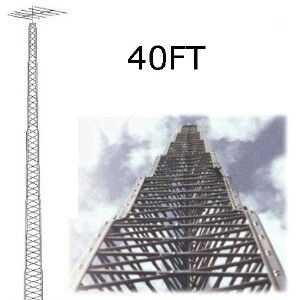 Is an antenna tower in your future? Yeah, I know. You never imagined yourself as the sort of person who would spend thousands of dollars on an antenna tower just so you could stop paying the cable company hundreds of dollars a month. But really the return on investment is pretty quick once everything is up. A tall tower like the one you see above can help you get your antenna up above the trees and other homes. It’s the one nearly foolproof way to improve your antenna reception if you’re out more than 55 miles from the broadcast towers. I’m not saying an amplifier or a bigger antenna won’t help — sure those options are easier and you should probably try them first — but for some people an antenna tower is not only the best option, it’s the only option. Putting your antenna up high not only cuts down on interference from trees, hills, and homes, but it actually gets better range because of the actual curvature of the earth. After about 120 miles, the earth itself interferes with broadcast signals. The graphic below is exaggerated but it gets the point across. At some point the towers can’t make up for the bump in the planet between you and them. If you raise the antenna up, even 50 feet, you can get a bit more distance before that ends up being a problem, simple as that. Getting a tower starts with researching the local ordinances in your city or town. In some cases the zoning laws won’t let you put up anything taller than 20-25 feet and that may not be enough to overcome the trees and homes between you and broadcast nirvana. However, if your area does allow you to have a taller tower, by all means go ahead and order one. Our experts at Solid Signal can help you put together the tower parts you need from the thousands we have avalable. We can design a custom tower that works for you and in some cases even give you some advice on how to get it put up. Obviously it’s not the easiest thing in the world to do and you’d want it to be supported by bolting it into concrete and possibly using some guy wires. But first you need to know what to buy. If you think there’s even a possibility of a tower in your future, you owe it to yourself to call the experts at Solid Signal at 877.312.4547 and start talking about it. We work with all the major manufacturers and we can help solve your problems in no time. Towers may be costly, but they can still pay for themselves within a year of putting them up, when you think about how expensive cable television is. Announcing the new Televes DATBOSS Mix!